Great food, great company — what more could you need for a pleasant evening? Whether you’re hosting a party at home for friends and family, or you’re planning a special occasion event for an engagement or a milestone birthday, food is sure to be the central theme of your event. 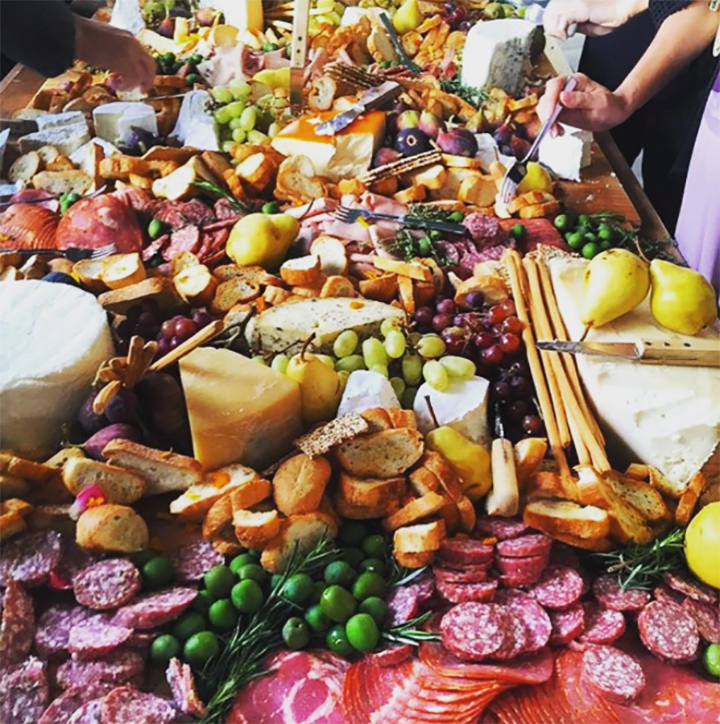 Sure, you can go fancy with passed hors d’oeuvres and a sit-down dinner, but why go to all that trouble when you can create an impressive charcuterie board that will not only feed a lot of people, but also impress them at the same time? Charcuterie boards are meat and cheese platters that typically include a variety of items that can be paired in mouth-watering combinations. They usually include various accoutrements that complement the meats and cheeses for a fun do-it-yourself appetizer experience for your guests. I love charcuterie boards because they can please just about any palate, and your guests can whip up all sorts of combinations to keep their experience unique and entertaining. Plus, they can be served any time of year, using seasonal provisions. While putting together a charcuterie board may seem overwhelming at first glance, it’s actually quite easy and a lot of fun to assemble. Here are some basic tips you will need to pull together the ultimate board. For an authentic and rustic look use a large wooden board (make sure it is food safe) or a large slab of marble. Mason jars or rustic glasses are perfect for breadsticks or condiments and you will want a variety of small and large bowls for items such as olives and spreads. Make sure that every cheese and spread has its own knife or spoon. The possibilities are endless here, but variety is key. Thin slices of prosciutto, dry cured salami, chorizo sausage. Try to pick 3-5 different options for guests to choose from. (See meat type suggestions below.) It would be helpful to add little signs outlining what the meat and cheese selections are so your guests know what they’re eating. Grissini (Italian breadsticks), fresh baguette and a variety of flatbreads will add so much to your charcuterie board: use your imagination. I like to provide gluten-free crackers as well as regular crackers. I choose crackers that don’t have a huge amount of flavor, added herbs or salt so that the crackers don’t detract from the flavor of what’s being added to them. Depending on how big of a role your charcuterie board will play in your meal, it’s nice to offer guests some fresh or dried fruit to compliment the meat and cheese. While the main attraction of a charcuterie board should be the meat and cheese, it is always smart to include fresh in-season fruit to add sweetness to the salty and to change up the experience. If you want to get extra fancy, you can roast or grill fresh fruit. 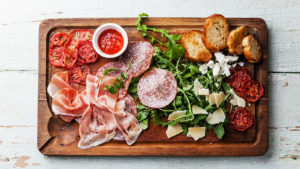 A big bowl of plums, fresh figs or dried apricots scattered among the meat and cheese, and grapes, sliced apples, pears or nectarines are all great additions to the charcuterie board and are so pretty. Ok, here’s where it gets interesting. Include 1 or 2 jams or preserves for some added flavor and sweetness to balance out the dry and salty meat and cheese. Fig spread goes amazingly well with many cheeses and meats, so I always like to include it. Walnuts, olives, antipasto, fresh honey, pepper or wine jelly, tapenade and marinated vegetables will make the board stand out from the rest. Provide something briny to pair with the meat and cheese. Pickled vegetables, such as gherkins or pickles, olives, pickled jalapenos or pepperoncinis are great on charcuterie boards. Whenever possible, include alcohol with your charcuterie experience. Wine and beer pair excellently with meat and cheese and can enhance the flavor experience. You want to pair bold-flavored meat and cheese with bold-flavored alcohol. For instance, goat cheese and prosciutto pairs well with white wine, while salami, cheddar and blue cheese go great with red wine. Perfectly imperfect is what you are aiming for here. 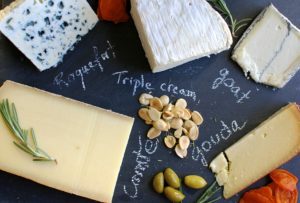 There are no rules, but it’s best to make the board about 30 minutes before serving to allow the cheese to come to room temperature and don’t leave the board out for longer than 2 hours at room temperature for food safety reasons. Don’t know where to start when it comes to selecting the meats, cheeses and accoutrements for your board? Not to worry. We have you covered. Representing Italian, Spanish and French regions, here are some of our favorite charcuterie board selections.